How often should you change your vehicle's oil? Most manufactures recommend that you change your vehicle�s oil and oil filter every 3 months or every 3,000 miles, whichever comes first. Consult your owner�s manual for the exact specifications for your vehicle or ask us for a free Manufacturer�s Scheduled Maintenance Guide for your vehicle. Some newer vehicles are programmed for up to 6,000 miles under �normal� driving conditions. Your owner�s manual will describe �normal� and �severe� conditions relative to your vehicle, but severe driving conditions include driving in stop-and-go traffic making frequent short trips (less than 5 miles per trip), lengthy high-speed trips, driving in extreme temperatures (over 90*F or below freezing), and towing and hauling. The average driver probably considers his or her driving conditions normal, but the truth is that most of us drive under severe conditions far more often that we realize and should time our oil changes accordingly. What type of oil should I be putting in my vehicle? Your owner�s manual will provide the manufacturer�s specifications for your vehicle. Most manufacturers will recommend conventional motor oil and a grade, i.e., 10W-30, but the temperature of your surroundings may require the use of a different grade. For instance, in a very warm climate, you may want to use heavier weight oil, such as a 20W-50. A very cold climate would suggest use of lighter weight oil, such as 5W-30, since the oil gets thicker in cold temperatures. See the chart for some common uses of motor oils by viscosity. 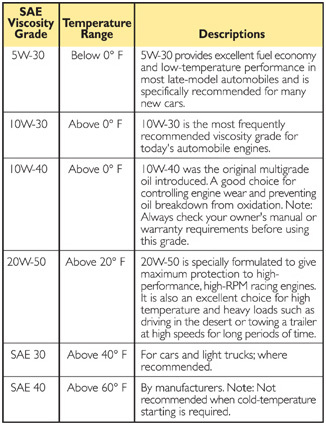 Most Ford models use 5W-20 oil and some new Honda models are using 10W-20 oil. These oils flow to the parts that need to be lubricated faster than other oils. This also provides protection during start up when most wear occurs. These oils also increase fuel mileage due to better pump ability and less drag on internal engine components. Select the oil change that best fits your automotive needs. The chart below will illustrate common uses of motor oils by viscosity.